Interstate 295 constitutes a regional bypass route for I-64 around the north side of Richmond and I-95 east of Petersburg and Richmond. 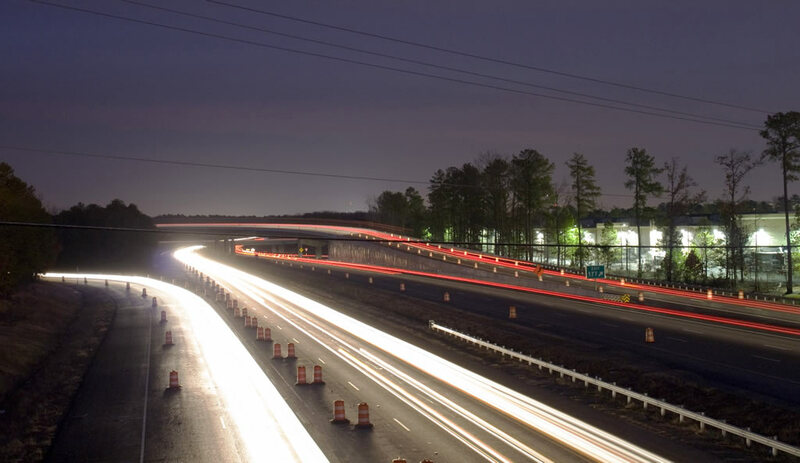 With six to eight travel lanes, the northern arc of I-295 serves a number of suburban communities including Glen Allen and Mechanicsville. The eastern leg connects with U.S. 60 and Virginia 895 (Pocahontas Parkway) west to Richmond International Airport (RIC). The Varina-Enon Bridge spans the James River along I-295 at the Chesterfield / Henrico County line. Costing $35.6-million to build,1 the cable-stayed bridge is similar to the William Roth Bridge (Delaware State Route 1) over the Chesapeake and Delaware Canal and the Sunshine Skyway Bridge (Interstate 275) over Tampa Bay in Florida. South across the Appomattox River, I-295 travels between the independent city of Hopewell and Fort Lee. The freeway concludes in a rural area by Second Swamp south of Petersburg. Interstate 64 eastbound at the flyover for I-295 east. Costing $49.1 million, the high speed ramp was completed in May 2009. Photo taken by Will Weaver (06/28/09). 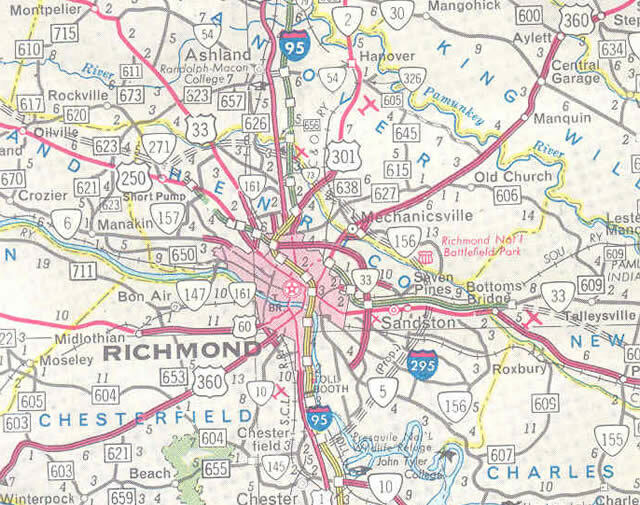 The Interstate 295 corridor was originally envisioned as a full beltway encircling Richmond. The design was later incorporated into an easterly realignment of the I-95 mainline off the congested Richmond-Peterburg Turnpike. Plans changed with the announcement that tolls on the Turnpike would be lifted in 1992. AASHTO formally endorsed the establishment of Interstate 295 south to Peterburg on June 9, 1986. Looking east from the Pouncey Tract Road overpass at the flyover connecting I-64 east with Interstate 295 south at Short Pump. Big box retail abuts the south side of the exchange from adjacent U.S. 250 (Broad Street). Photo taken by Will Weaver (01/13/09). 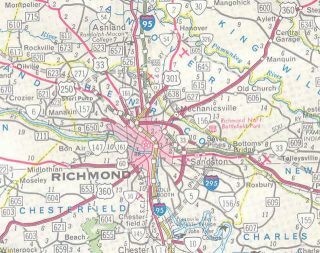 Interstate 295 proposed as a 270-degree beltway around Richmond – 1968 Virginia Official State Map. Pochontas Parkway (SR 895) was eventually constructed in place of the southeast leg of I-295 here. I-295 south at the collector distributor roadway for the cloverleaf interchanges with Interstate 64 and U.S. 60 east of Richmond. Photo taken by Will Weaver (06/06/09). A flyover for Interstate 64 east from the southbound mainline of I-295 was added at this exchange in June 2001. These overheads at the SSR 629 (Rives Road) overpass referenced the former lane drop for I-95 south at the merge with Interstate 295. Vidcap taken 08/26/96. Interstate 295 arcs southwest 1.5 miles from the cloverleaf interchange (Exit 51) with Nuckols Road near Wyndham to conclude at I-64. Photo taken 06/17/05. A pair of end signs stand along Interstate 295 one mile ahead of the modified trumpet (Exit 53) with I-64. Photo taken 06/17/05. These overheads were replaced by 2014 with a new sign bridge added a half mile ahead of Exit 53A. The signs however still reference a quarter mile to I-64 west. Photo taken by Will Weaver (05/31/09). Exit 53A leaves I-295 northbound for Interstate 64 west to Charlottesville and Virginia 288 south to Midlothian. Photo taken by Will Weaver (05/31/09). Exit 53B follows a dual lane drop ahead of a roadway stub at the southbound end of Interstate 295. I-64 east connects with U.S. 250 nearby at Short Pump. Photo taken by Will Weaver (05/31/09). Traveling east from Virginia 288 and the Goochland County line, Interstate 64 progresses a mile and a half to Exit 177 with I-295 southbound. Photo taken 12/16/16. Construction from 2006 to May 2009 added a two lane flyover (Exit 177) for I-295 southbound from I-64 east. Work also added a third eastbound lane for I-64 and removed the loop ramp and overpass formerly linking with I-295. Photo taken by Will Weaver (06/28/09). A fourth lane opens ahead of the Pouncey Tract Road overpass and Exit 177. 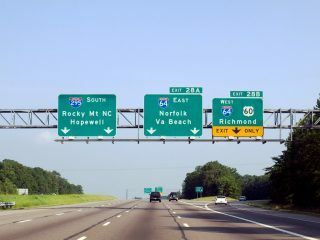 Interstate 295 provides a long distance bypass for I-64 eastbound destinations such as Williamsburg and Virginia Beach. Photo taken by Will Weaver (06/28/09). Exit 177 departs Interstate 64 east for I-295. Interstate 295 connects with I-95 north to Fredericksburg and Washington, DC in ten miles. Photo taken by Will Weaver (06/28/09). Westbound I-64 crosses the retail strip along U.S. 250 (Broad Street) at Short Pump 0.75 miles ahead of Interstate 295 (Exit 177). Photo taken by Will Weaver (06/28/09). An auxiliary lane was added to westbound Interstate 64 from U.S. 250 (Broad Street) to I-295 south in 2009. Photo taken 12/16/16. Exit 177 for I-295 leading east toward Glen Allen was expanded to two lanes in 2009. I-64 heads 56 miles west to Charlottesville. Photo taken 12/16/16. Heading south from U.S. 460, Interstate 295 navigates through a broad S-curve by Hanzik Pond to I-95. Photo taken 01/04/19. Exit 1 leads motorists back north into Petersburg, where Interstate 95 connects with I-85 south to Durham, North Carolina. Photo taken 01/04/19. Traffic along I-295 continues another 0.75 miles beyond Exit 1 to merge with the inside lanes of Interstate 95 southbound. Photo taken 01/04/19. Interstate 95 travels 36 miles south from I-295 to U.S. 58 in Emporia. 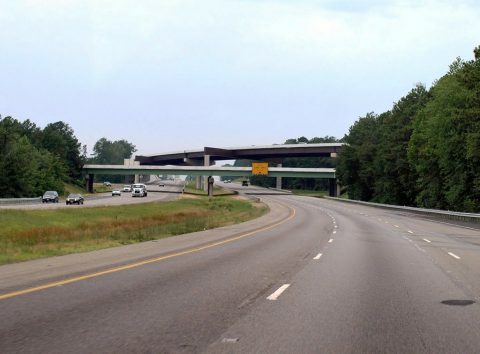 Drivers taking Exit 1 will reach Interstate 85 south in 4.7 miles. Photo taken 01/04/19. Most guide signs for Interstate 95 on I-295 south were replaced in September 2013. Photo taken 06/02/03. One quarter mile ahead of Exit 1 to Interstate 95 north on I-295 south. Photo taken 06/02/03. Interstate 295 concludes 92 miles north of Rocky Mount, North Carolina. Photo taken 06/02/03. The first sign for Interstate 295 north (Exit 46) precedes the modified diamond interchange (Exit 46) with U.S. 301. U.S. 301 shifts to the west side of I-95 leading into Petersburg. Photo taken 12/21/18. Several diagrammatic signs display the bypass route of Interstate 295 in the Petersburg and Richmond area. Referencing travel times calculated with ITS (Intelligent Transportation Systems) technology, this assembly at Exit 45 was added by 2016. Photo taken 12/21/18. I-95 continues one mile north from U.S. 301 to the three-wye interchange (Exit 46) with Interstate 295 north. Photo taken 12/21/18. Tavern Road (SSR 626) spans I-95 a half mile ahead of the separation with Interstate 295. I-295 returns to Interstate 95, 44.5 miles to the north in Henrico County. Photo taken 12/21/18. Exit 46 parts ways with I-95 north beyond the bridge across Second Swamp. I-295 runs east of Richmond International Airport (RIC) 26 miles to the north between SR 895 (Pocahontas Parkway) and U.S. 60. Photo taken 12/21/18. Interstate 95 travels north through Petersburg to Colonial Heights and Chesterfield County. I-295 loops east between Fort Lee and the city of Hopewell to the Varina-Enon Bridge. Photo taken 12/21/18. Replaced guide sign for I-295, one mile south of the split from Interstate 95 north. Photo taken 06/02/03. Interstate 295 provides a regional bypass of Richmond for I-95 north to Washington, DC. Photo taken 06/02/03. Two lanes separate for Interstate 295 north around Petersburg. Speed limits on the bypass route are 70 miles per hour versus 65 and 55 miles per hour on I-95 along the Richmond-Petersburg Turnpike. Photo taken 06/02/03. U.S. 460 separates from Interstate 95 south at a cloverleaf interchange (Exit 48A) 1.75 miles north of I-295. U.S. 460 follows Wagner Road east to SR 106, where it turns south to meet Interstate 295 at Exit 3. Photo taken 01/01/17. Progressing south, I-95 converges with Interstate 295 (Exit 46) a half mile beyond the exchange with SSR 629 (Rives Road). Photo taken 01/01/17. Exit 46 departs from the left side of I-95 south for Interstate 295 north to Hopewell. 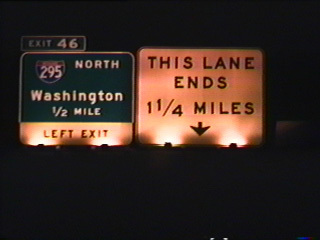 A carbon copied sign references the former lane drop that took place at the I-95/295 southbound merge. Photo taken 01/01/17. “New I-295 Bridge Opens to Traffic as Work Goes on.” Richmond Times-Dispatch (VA), July 19, 1990. “A $20 Billion Traffic Jam – Virginia’s Highway Experts are Looking for a Way Out of Seemingly – Endless Problem.” Richmond Times-Dispatch (VA), June 1, 1986. “Board Awards I-295 Contract.” Richmond Times-Dispatch (VA),December 20, 1990. “I-295 Section East of City to Open Today.” Richmond Times-Dispatch (VA), October 7, 1988. “I-295 Section to Hopewell is Opened.” Richmond Times-Dispatch (VA),January 21, 1992. “State Opens Last Portion of I-295.” Richmond Times-Dispatch (VA), June 26, 1992.